“...the actors work together, forming a tightly woven ensemble that skillfully slips back and forth between satiric humor and passionately played dramatic action." 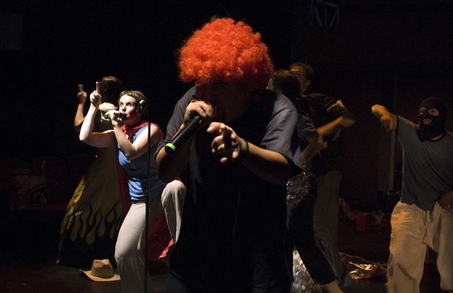 Dos Pueblos is a collaborative performance between Hand2Mouth Theatre (Portland, Oregon) and La Comedia Humana (Mexico City). This original bilingual performance explores the history of Mexico and the United States as a violent love affair between two nations that cannot get divorced. A brutal ballet of words and images, Dos Pueblos is filled with personal intimacy and vivid allegory. The actors stand huddled and half naked, a single line sketched across their backs; a live-feed of a miniature desert landscape is video-projected onto a barren decaying storefront, two men cross the border with water coolers strapped to their backs; Our Lady of Guadalupe sells homemade tortillas in Grand Central Station; men, women and pop stars are massacred at the Alamo; the child heroes of Mexico are killed over and over as the US President apologizes; Michael Jackson dances with Frida Kahlo; three women giggle ferociously as they undergo skin-darkening treatments; and everyone in the theatre joins together to drink tequila with coke and eat tacos slathered in ketchup and relish. Under the shared direction of La Comedia Humana’s Ruben Ortiz and Hand2Mouth’s Jonathan Walters, with writing assistance from Miracle Theatre’s Olga Sanchez, the performance unfolds as an intricate collage, drawing on dance-theatre movement, recorded testimonials, loaded symbols and multi-lingual songs of love and war. Performers channel the rage, co-dependence, mutual attraction and revulsion between their two nations, in a surreal, politicized landscape split by an ever-shifting border. La Comedia Humana is a Mexico City-based company under the direction of Rubén Ortiz. A writer, actor, educator and theatre director, Ortiz serves as professor at the Universidad Nacional Autónoma de México and the Working Universidad Autónoma del Estado de Hidalgo; using methods of physical theatre he has created one-person and large ensemble shows which have toured internationally, including tours to New York City, Vienna, Prague, Madrid, Bilbao and Medellín, Colombia, as well as across Mexico. In the past few years, Ortiz has initiated site-specific work as well as ‘threshold’ theatre in collaboration with other artists and artistic disciplines for theatrical installations. In addition to Directors Walters and Ortiz, participants include performers Julie Hammond, Faith Helma, Erin Leddy and Jerry Tischleder from Hand2Mouth; performers Alejandro Benitez, Avelina Correa, Carlos Cruz Islas and Alam Sarmiento from La Comedia Humana; set designer Sibyl Wickersheimer and lighting designer Christopher Kuhl. Dos Pueblos / Two Towns was co-commissioned / produced by Miracle Theatre Group. 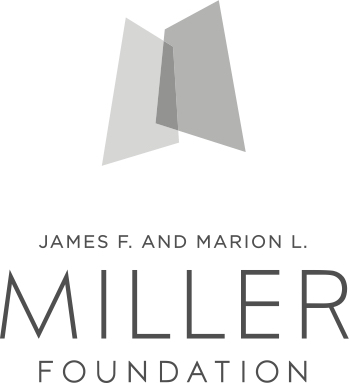 Major funding for development of the piece provided by the Rockefeller Multi-Arts Production Fund. 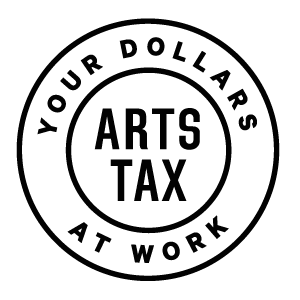 Additional support is provided by the City of Portland through the Regional Arts & Culture Council, the Paul G. Allen Family Foundation, the PGE Foundation and the Celebration Foundation. Dos Pueblos is currently unavailable for touring.